A battle rages within every one of us every day. It&rsquo;s the clash between our sense of stubborn self-sufficiency and God&rsquo;s call to recognize that we&rsquo;re really nothing without Him. It&rsquo;s pride versus humility. And it&rsquo;s a fight we can&rsquo;t win without looking repeatedly to Christ and the cross. C. J. Mahaney raises a battle cry to daily, diligently, and deliberately weaken our greatest enemy (pride) and cultivate our greatest friend (humility). His thorough examination clarifies misconceptions, revealing the truth about why God detests pride and turns His active attention to the humble. Because pride is never passive, defeating it demands an intentional attack. The blessing that follows is God&rsquo;s abundant favor. God clearly states that He is drawn to the humble. He&rsquo;s also clear that He opposes the proud. These two, humility and pride, cannot coexist. Where one is fostered, the other is defeated. C. J. Mahaney paints a striking picture of the daily battle quietly raging within every Christian and asks whether you will passively accommodate the enemy of your soul, pride, or actively cultivate your best friend, humility. When you acknowledge the deception of pride and intentionally humble yourself, you become free to savor abundant mercies and unlikely graces. You will find a new life is yoursa? ?a life God richly favors. A God-glorifying life you don&rsquo;t want to miss. Another home run by Mahaney! C.J. Mahaney's latest book, Humility: True Greatness, is an amazing challenge to believers to think seriously about how much weight God has placed on humility. The challenge of this book springboards from Isaiah 66:2, "This is the one whom I will look: he who is humble and contrite in spirit and trembles at my word." As the title hints at, Mahaney has put together a concise and practical book that calls us to seek humility, which is how God defines true greatness. The author has a clear, yet personable writing style and Humility is a prime example. He tackles such topics as defining biblical humility ("Humility is honestly assessing ourselves in light of God's holiness and our sinfulness." p. 22) and pride ("Pride is when sinful human beings aspire to the status and position of God and refuse to acknowledge their dependence upon Him." p. 31). Mahaney also does a wonderful job giving practical encouragements of how to foster humility in our daily lives: through prayer, acting in grace toward others, and opening oneself up for correction. There is even a checklist summary of practical things we can do to strive after humility at the end of the book. Of course, a lot more could have been written, but an exhaustive manifesto on humility does not seem to be Mahaney's ambition. Rather, this excellent book is a crisp, if not humble, approach to a hugely important topic in the life of a Christ-follower. As I have observed with all of CJ's books and teaching, this book shows the marks of the Spirit producing a man after God's own heart. This book was probably one of the shortest books I have read in a long time, but it may prove to be one of the most influential on me during this season of my life. Being one of the guys who Collin Hansen's CT article described as Young Restless and Reformed, I have seen an increasing love for theology and the Sovereignty of God, yet a disconnect between a theology that emphasizes God's grace as so supreme and a lack of humility like the force of my attitude is truly what is in control. CJ's book was very helpful to put a more accurate frame how I see my life and the lives of others. "I am not a humble man, but a proud one, but I am a man who by God's grace am pursuing humility." Oh how if each of us could get a tiny grasp of this in our own lives, how much more God glorifying would our interactions be with one another, even over hotly debated theological topics. "The sad fact is that none of us are immune from the logic-defying, blinding effects of pride. Though it shows up in different forms and to differing degrees, it infects us all." Mahaney begins by making the case for how crucial this topic really is. He then takes a unique angle that I really appreciated. I always thought pursuing humility was important simply because the opposite, pride, was so abominable. But although Mahaney doesn't mince words about the seriousness of pride, he also turns attention to the positive: Humility is something to cultivate because of the promise it offers ("God gives grace to the humble"), not just because of the curse its alternative brings. Mahaney's self-deprecating humor and honesty about his own struggles with pride make him relatable and credible. He often anticipated my questions and objections with powerful illustrations of pride in his own life. And his disclaimers that he's unqualified to write a book about humility, combined with his friends' and family's endorsements of his humble spirit, only add to his credibility. More than once, he caught me with a direct hit--describing my prideful thoughts or heart attitudes with startling exactness. Yet Mahaney isn't out to beat you down and discourage you. Part of the beauty of the book is the thread of the gospel woven throughout. Over and over, he brings you back to the grace and mercy of the cross. One of the most powerful things I learned from this book was that having a correct definition of "greatness" and a perfect example to follow (Jesus) is not enough for me to attain humility. I can't be great unless I imitate Christ...but I can't imitate Christ apart from the cross. Only Christ's death--His sacrifice to ransom us from sin--will set us free from pride and enable us to be humble. Understanding that is the key to toppling pride. It all comes back to the cross--the foundation of Mahaney's life and ministry and the core of this book. Once he has laid the theological groundwork, Mahaney gets extremely practical. Pride must be actively fought; humility must be intentionally cultivated. This character development isn't just going to happen as we read the book--it's going to take work. So the second half of the book lays out specific steps to take--at the beginning and end of each day, throughout the day, and occasional practices. Each chapter challenged and inspired me. The book is a swift and easy read, the first time through. Once you put it down you have to pick it back up and then study it, in depth, and try to soak its truths deep into your heart. The shadow a true Christian should cast is one of real love and humility and C.J. Mahaney teaches one the importance of it, how Jesus IS humility, and how we need to live like Him. I found this book very inspiring. It didn't simply provide some watered down commentary on something else, but quoted good sayings from well respected Christians and the Bible. I particularly enjoyed the explanation of the biblical book of Habukkuk and the pattern of drawing nearer to God that one can follow from these biblical passages. I also enjoyed the authors focus on Christ as the true author and pattern of humility and the service and blessings we can enjoy by his grace. The author also provides good practical advice for any Christian on how to start and end the day with prayerful reflection and humility, accepting life's trials come what may. I haven't wanted to read this book for the mere fact that I am selfish and didn't want to be that convicted of my prideful attitudes. It wasn't until one of my elders read the book and told me what impact it had on his thoughts and attitudes of his daily walk, that I decided to pick up the small, but towering book of truth. CJ Mahaney has put together a very strong book that seems to come from the outworking of his previous works which focus on Christ and His cross. This seems as though it is the natural outflow of his writings on "Christ our Mediator" and also "The Cross Centered Life." CJ comes to this conclusion and outworking by writing the book "Humility: True Greatness." In this part CJ comes out and helps define what humility is and what pride is. He then walks through the implications, promises and perils of both. This is classic Mahaney. Pointing us back to our Saviour. It is as although he has "defined" humility and pride in the first part he cannot truly define humility without coming back to the Saviour and the cross. Mahaney shows some ways that the Christ shows humility to his disciples in Mark 10 and also through the great redemptive plan in the cross. This is where you start to simply understand your need of humility to truly walk in the ways of Christ and this is where I started to ask, "give me some ways to understand this practically" and that is what Mahaney delivers in the third part of the book. Mahaney really lays out some great practical ways to come to an understanding of humility in our lives and ways to see the pride in them as well. He lists out for most of the book, as this is by far the longest part, practical ways to be humble and ways to continually point out prideful parts in our lives. All in all, this is a very hard book practically to read, as I have found all of Mahaney's books to be, but very easy for any layman to pick up and walk through. Very challenging without being a cry from the high towers of holiness as this book is read and written through the eyes of someone you feel is having the very same struggles you are in the subject that is being written, yet someone who has much knowledge to share on how to "accomplish" the set thesis. How to be humble in # easy steps. Humility is not a bestselling topic. In a world that celebrates pride, achievement, and the success and glory of individuals, it is difficult to convince many that greatness lies in reverence. In his book, "Humility, True Greatness," C.J. Mahanney gives us hope that humility still has its value. He makes clear in his introduction his qualifications for writing this book. "I'm a proud man pursuing humility by the grace of God. I don't write as an authority on humility. I write as a fellow pilgrim walking with you on the path set before us by our humble savior." This book is very practical. Mahanney starts out writing of the dangers of pride and the blessings of living humbly. He then describes how not only the Bible but also the examples of corporate America show that it is most often driven leaders that "were self-effacing and modest" who rose to the top. Even more rewarding is the concept that "humility draws down the gaze of [...] God," but that it takes God to practice genuine humility. In the second half of this book, Mahanney suggests to the reader how to practice this journey to pursue humility. Chapters include "As Each Day Begins," "As Each Day Ends," "Identifying Evidences of Grace," and "Encouraging Others," and each gives great stories and examples to cultivate a life of humility and more vivid understanding of its presence in daily living. Mahanney finishes the book describing the legacy of greatness left behind after a life of humility, and gives us a list of suggestions to reference as we seek to apply these ideas to our lives. After listening to a pastor give an address to his congregation on the topic of "Finding Joy in Humility" (Pastor Mark Driscoll, Mars Hill Church, Seattle), I remembered his reference of Mahanney's book, and used the power of Amazon.com to acquire my own copy right away. The book has a lot to offer to anyone who might open up their heart to the principle that is guaranteed to lead to true greatness. No more contending for supremacy with God! In his endorsement of the book Mark Dever says "If you are struggling with pride you should read this book, if you are not strugglinh with pride, you definitely should read this book." I didn't need much convincing to let me know I was prideful, but as I read "Humility: True Greatness", I began to see how much pride ecompassed every aspect of my life. C.J. Mahaney's very biblical and practical approach to combatting pride is extremely beneificial and life-changing. There are many ideas expressed in ways that completely hit the mark. To think when we act in pride, when we place our own interests above others, when we fail to trust God and instead rely on our own weak selves we are contending for His supremacy! This book should be required reading for every Christian. Sadly today, our churches and larger denominational ministries foster a sense of pride and achievement. We must recover an understanding of true greatness if we want to see victory in the Christian life and true revival in our generation. Although, he would certainly deny it (as is clear, if you have ever had the privilege of hearing him speak) Mahaney himself is truly a humble man, and I believe that is one of the reasons he has been so mightily used by God. Buy the book, and get started learning humility. Arrogance is something with which all Christians struggle, especially leaders. This book offers valuable insights for that struggle. Part 1 describes the ongoing battle between humility and pride. Part 2 redefines greatness in the person of Jesus Christ. Part 3 offers practical tips as to how to pursue humility each day of our lives. With an open heart, this book will open your eyes! Short, consise, well-versed, advice on living a life of humility, not as the world sees it (weakness, shyness), but as seen through the eyes of God. True greatness is achieved through true humility. And C.J. Mahaney systematically lays out a blueprint for God's plan for our life. God's plan; not our plan. This is the key to understanding true humility; understanding that we must be servants, as Christ demonstrated, in order to remain on the path that God has chosen for us. Are you willing to lay all at the foot of God in order to let him transform you in to a creature that is successful; at home, at work, at play. God wants success for his people, but he desires humility. A continual reference to one key point in this book is that God gives grace to the humble. Well, as we all know, God's grace is all we have to begin with because we are nothing without him, but now we see that there is something that we can do to draw God's gaze and bring grace to our lives. What a true relief. Through true biblical humility, we can attract God's gaze, draw his attention and receive blessings beyond which we have already, through grace, received. How humbling, how encouraging, how exciting! I have suffered many setbacks in my life, inlcuding 10 years in darkness after I turned my back on God, but this book, the first that I read when I truly dedicated my life to the Lord, has led to such a great understanding of what God has for us, for me. C.J. Mahaney uses real-life analogies and stories to relate the message that is repeated throughout God's word, and he backs all of that up with scripture. I cannot more highly recommend a life changing book, especially for a new Christian; this book will provide the foundation for all future endeavors in your life in God's will. This book helped me to understand that I was self-centered, egocentric and selfish; even with my wife and daughters who I love and thought I would do anything for. It helped me to find the places, deep inside, that I needed to change in order to effectively humble myself in every facet of my life. I still suffer trials, to be honest, I feel that I suffer more since I became a true Christian, but I see them as a blessing, a gift, an opportunity for me to, as it says in James, grow in faith. James 1:2-3 (not referenced in the book, but so very valid here) states; "Consider it pure joy, my brothers, whenever you face trials of many kinds, because you know that the testing of your faith develops perseverance" (NIV). What an encouragement! What a blessing! GRACE!!! Please, read this book. The chapters are short enough for a devotional period and the results, if you are receptive to God's word, are remarkable. This truly is a humbling book, in the best and most positive sense of the word. It helps us see how habitually rooted we are in ourselves. "Aha" moments include the premises that comparing ourselves to others is pride, and that pride is contesting for supremacy with God. The premise of C.J. 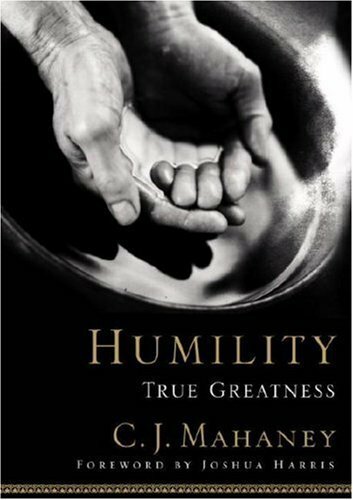 Mahaney's new book Humility: True Greatness is from a quote by John Stott that says "At every stage of our Christian development and in every sphere of our Christian discipleship, pride is the greatest enemy and humility our greatest friend." Mahaney takes the sin of pride very seriously and sees the solution to it as equally imperative. Being one of the founders of Sovereign Grace Ministries and the author of several other devotional books that are graced with endorsements by Al Mohler, Jerry Bridges Ligon Duncon, Mark Dever, and Wayne Grudem, Mahaney has much to be proud of; but he doesn't think so. Following his foundational principles laid down in his book The Cross-Centered Life Mahaney contends true humility is cultivated at Calvary "beholding the lamb of God." This, he avers, transforms the self-confident into humble servants for the glory of God, and thus makes the strongest, most insightful point in the book. After delineating some helpful teaching on the nature of pride, humility, and the power of the gospel Mahaney spends middle section of his book developing a number of strategies that he believes will nurture seeds of humbleness planted in the sojourning saint. He recommends studying the transcendent attributes of God (omniscience, onimpotence, omnipresence), the nature of sin (according to John Owen), and "the Doctrines of Grace" (Calvinism). Though he does not say explicitly, the implication, at least in this area, that non-Calvinists cannot truly cultivate humility looms in the background-a truly fictitious notion when one examines the lives of such saints as D.L Moody and Billy Graham. This was the weaker portion of the book. Beyond that he spends an excessive amount of ink on habits of piety that require as much humility to practice as they produce. Things like rising early to worship God, memorizing Scripture while stuck in traffic, thanking God for sleep (! ), inviting correction, and encouraging others are all part of the game plan for developing an unassuming, self-effacing character. These are wonderful things, of course, but problematic to teaching humility like this, however, is that they assume what they are trying to yield: humility. However, I only say this speaking from my own futile experience and don't claim to have a corner on the "how to" when it comes to refining a humble character, so readers of this review would do well to take my words with a grain of salt. Mahaney does break in with his sense of humor, however. The suggestion of playing lots of golf made me laugh out loud with hearty agreement. At this point Mahaney shines with his commitment to not taking himself too seriously, which is most commendable. He ends the book with some very helpful chapters on humbly engaging trials suffering by looking at the text of Habakkuk, and raising humble children. I cannot say this book is the best on humility and pride. Andrew Murray and CS Lewis have communicated it in more poetic terms mixing good doctrine with mystery that resonate more with the soul. Even so, Mahaney does provide a nice field manual for those in his Reformed Baptist heritage, and it is not surprising to see the endorsements come from this tradition. As a pastor, I am always on the lookout for books that help not only myself, but others. This was the first book by Mahaney that I ever read and I loved it. The book reads like a sermon from a caring pastor, who himself is more than willing to be vulnerable. It contains not only sufficient biblical discussion of Humility to edify, but it aims for practical applications also. C. J. Mahaney in "Humility: True Greatness" compares the physical check up of a physician with the need for a spiritual check up of the same nature. He wields the surgeon's scalpel to the soul of man with his piercing questions for self evaluation. The Book is divided into three parts. In part one Mahaney discusses the promise of humility and the peril of pride. In part two he redefines greatness and shows how greatness can be demonstrated. Part three deals with the pursuit of humility, the importance of focus, evidences of grace, correction,responding to trials, and leaving a legacy. This is a book for pastors, church leaders, and individual Christians. It is thought provoking, hard hitting, yet sensitive while pursuing an intimacy with God that produces humility. This is an excellent book for devotional reading and for frequent future reference. It should be clear to the reader that no one can be a self-proclaimed expert on this topic. It is clear that shouting "I'm way more humble than you are!" is self-defeating. Mahaney acknowledges this--he admits he is a proud person. It is only the proud person who acknowledges his pride that is qualified to write on humility. It is only due to Mahaney's failures in being humble that he can write about the need to be humble. Humility: True Greatness is not a probing theological book nor a deeply spiritual text. It is short and sweet, beginning with a few chapters on the necessity of humility and proceeding with several chapters of practical advice on how to live out a God-pleasing life of humility. One thing that I greatly appreciated was Mahaney's high view in chapter four of the death of Christ. Christ died not merely to demonstrate the ultimate in humility, but for us also to be humbled by dying with him and then being exalted because of him. He ransomed us--sorry, captive to sin, miserable and helpless. However, at this point, it seemed that Mahaney should explicitly explain the doctrine of Christ's substitutionary atonement. For readers not clear, to know this doctrine is crucial--that Christ suffered and died primarily to take the punishment we deserved for our many sins, and to credit to us his righteousness that we could never achieve. He endured in three hours on the cross our eternity in hell, and thus saved us that we might be forgiven and be made right with God. This doctrine is key to Mahaney's point in the first half of the book yet he assumes we know it. Still, Mahaney's resolute passion to write of the cross, the cross, and the cross is needed and appreciated. There is a section in Chapter 9 about using appropriate words that I thought were particularly fitting for witnessing. 1 Thessalonians 5:14 gives us a hint to "admonish, encourage, help, and be patient" to certain people (read the verse and learn who). Mahaney directs us better to consider the needs of those we meet, not trying to impress them or convert them, but rather listening sincerely and humbly to determine their need. The purpose of your words should be to give grace to those who hear (Ephesians 4:29). Another direction, especially when witnessing to those who claim to be Christians (and may indeed be) is to never correct another wihtout reminding the person of the gospel--because correction is impossible without Christ as the corrector. Mahaney also urges us to invite others to correct us and to seek correction. I pray and ask that you hold me accountable for the things on my site. C. J. Mahaney's Humility is a much-needed book for this generation of Christ-followers. I have a confession: Having recently read Andrew Murrary's classic of the same title, I was not expecting much from this book. No offense to Mahaney, for whom I have great respect, but I just couldn't imagine a book impacting me more on this topic than Murray's. To my delight (and conviction), Mahaney delivered a fantastic work that puts flesh on the topic of humility and provides concrete, practical steps to becoming people of humility. Obviously, Mahaney's book will be more accessible for this generation because his language is modern and his examples are fresh and referenced to contemporary culture. The book begins with a discussion on the battle between pride and humility and then demonstrates how Christ re-defined what it meant to be great. The last part, which comprises the bulk of the book, gives readers practical ideas for increasing their dependence upon Christ and therefore increasing in humility: spiritual disciplines for the morning and evening, Bible study ideas, ways to encourage others, the importance of accountability, etc. There was even a chapter on raising children who understand and strive for the Biblical greatness found in humility. As I read this book, I underlined a lot, jotted down many notes in the margin, implemented some of the principles, and discovered an idea for my next personal Bible study. I felt the chapter on practices for the end of the day would have been more developed if it included a more in-depth explanation of self-examination disciplines such as the Ignatian examen, and I disagree slightly with some of Mahaney's doctrinal positions, but this is definitely a book worth reading and recommending. I need this book. In fact, I believe every Christian needs to read C.J. Mahaney's book on humility. And not just once, but several times. At least once a year. Humility: True Greatness (Multnomah, 2006) is one of the most practical, pastorally helpful books I've ever read. For this reason, I find myself coming back to it every few months or so. C.J. will tell you up front that Humility is not written by an expert on humility. He confesses that he is "a proud man pursuing humility by the grace of God" (13). But it is precisely because C.J. acknowledges his weakness that he is able to write so effectively on the subject of humility. Here is how C.J. defines humility: "honestly assessing ourselves in light of God's holiness and our sinfulness" (22). Bouncing back and forth between these "twin poles," C.J. spends the first two sections laying out the perils of pride and the way in which Jesus redefined success and greatness. The final section of the book focuses on the daily cultivation of humility and the deliberate weakening of pride. C.J. points out the subtle ways in which pride gains a foothold in our lives. He shows how pride leads to bitterness. He reminds us of the cost of our salvation, always pointing us back to the cross. I have benefited most from C.J. 's advice to seek out "evidences of grace" in other people. We are tempted to criticize and find problems with everyone else. But C.J. calls us to look for the evidences of God's grace in others. This practice curbs our prideful tendencies and increases humility. I just finished reading Humility and it one of the rare books that I am sad to finish. It was a deeply challenging book that I wish every Christian would read and I am certain that every Christian would benefit from. Mahaney defines Humility as "honestly assessing ourselves in light of God's holiness and our sinfulness." I found that definition to be powerful. It was a humbling experience to be forced to realize that because of my sinfulness I deserve death and hell, that is what I deserve yet God has chosen to show me grace and mercy through the Cross of His Son. So when I look at all the good in my life I am forced to confess that I can take credit for none of it. It is all simply an opportunity to praise the goodness of my great God. Two of Mahaney's strengths shine in this book; he is always a gracious and is open about his own struggles. The book is not written as a learned treatise from a man who portrays himself as a paradigm of humility, rather as a shared education from a proud man pursuing humility urging us to join him in that pursuit. Mahaney is also intensely practical. Throughout the book there is guidance on how to cultivate the attitude of humility. I found especially helpful his guidance on how to start the day and I am already benefiting from it. He advises that we should begin each day acknowledging our dependence on God and expressing gratefulness to Him. There is a great deal of practical guidance of this nature throughout the book. But starting the day in this fashion has changed the nature of how I face the obstacles of the day, how I approach the appointments and duties of each day, they are no longer seen as opportunities to work or to accomplish things or even simply to do what must be done; but rather as opportunities to rest in God's strength and to see Him at work. This book is one of the best books I have ever read. I would recommend it for anyone who needs or wants to be more humble. It has broadened my prospective not only as a Christian but as a recovering alcoholic. This book is so touching and moving that I couldn't put it down. It makes me believe that "God is good all the time and all the time God is good". This a true MaHaney masterpice! I thought, wow, this is going to be a great book. I wasn't prepared for what I got. A book that broke me, that had me on my knees, that used the word of God to pierce between my joints and marrow. Flawless theology, intensely practical, powerfully written. Ultimately, there can be no effective expansion of your life's mission and ministry, no fulfillment of the specific purpose He's called you to, apart from the cultivation of humility in your heart and the weakening of pride in your life. Let this book be a tool that the Spirit uses to expose the pervasiveness and perversity of pride in your life and challenge you to turn in humility and repentance to a gracious God. Nothing escapes God's notice, but one thing captures His gaze. Of course, God hates all sin. But, as Mahaney notes, "from God's perspective, pride seems to be the most serious sin." (pg. 30) God passionately hates pride, and actively opposes the proud. But, He gives grace to the humble (see James 4:6, and 1 Peter 5:5). In light of this truth, shouldn't we, as believers, be actively seeking to eradicate pride and pursue humility? "How, for the rest of my life, can I deliberately and diligently mortify pride, and pursue humility on a daily basis?" The majority of this book is given to simple, practical, and most importantly, biblical advice on how to answer this question. I found chapters 5 and 6 especially helpful, as Mahaney gives suggestions for meditation "As Each Day Begins" (ch. 5) and "As Each Day Ends" (ch. 6). He also suggests several ideas for going beyond our daily studies, and into times of extended concentration and study in chapter 7 ("For Special Focus"). A great book with a practical approach!